From the time your child’s first baby tooth erupts, they require preventative care to protect their baby teeth from damage. In addition to allowing a child to learn to eat and speak correctly, baby teeth act as place holder’s for the permanent teeth. The health of their baby teeth will directly impact the health of their permanent teeth. We provide the preventative care young children need to ensure they develop healthy teeth and gums. 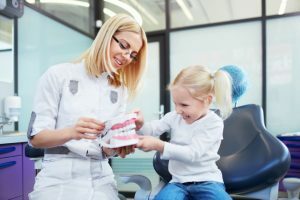 While building strong positive relationships with young children, we provide the dental cleanings and checkups, dental sealants, fluoride treatments and other preventative care children need. After your child has lost most of their baby teeth and the adult teeth are now in place, we provide orthodontic treatments. Orthodontic care is needed to ensure your child’s teeth are properly aligned, including their bit. With the proper alignment, your child will have a decreased risk for gum disease and tooth decay, while we ensure their teeth align properly for correct oral functions. As we age, our teeth are likely to suffer from certain cosmetic flaws that are related to age, lifestyle factors, or dental problems that weren’t corrected during adolescence. We understand that a less than perfect smile causes you to feel self-conscious, which is why we have the cosmetic services you need to promote a beautiful smile. Whether you needed tooth-colored fillings and crowns, teeth whitening, or porcelain veneers, we’ll give you a dazzling smile that will last for years. Throughout the years, our teeth begin to suffer the impact of age. It’s not uncommon for our teeth to chip, crack, become decayed, or even fall out as we get older. We have the restorative services you need to protect your teeth as you age. No matter if you need a root canal, dental prosthetics or periodontal therapy, we have the specialized care needed to ensure the health and function of your teeth. Dental Group West is committed to meeting your family’s dental needs throughout the years. As a family dentist in Toledo, we have the comprehensive care your family needs through all stages of life. We’ll care for every member of your family to ensure your family develops healthy, beautiful smiles to last a lifetime.